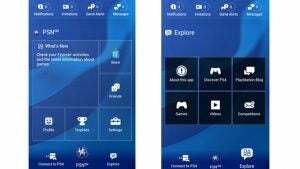 The PS4 companion app you can live without for now. What is the PlayStation app? The PlayStation app has been available for Android and iOS users since 2011 and now it’s been updated to coincide with the launch of the PS4. Unless you had the desperate need to check your trophy count or see what PSN friends were doing online, it really wasn’t worth making space on your smartphone or tablet for. If you paid out to buy Sony’s next gen console at launch, it’s defintiely more useful this time, but it’s not an integral part of the PS4 experience. Once you’ve made your way past the lenghty User Agreement page and log in with the same PSN account assigned to the console, you’ll be met with the a single homescreen that has a very familiar look to it. It’s clearly taken some inspiration from the PS4’s new, very blue Dynamic Menu. The layout shares some similarities as well placing notifications, invitations, game alerts and messages up top. Down the bottom there’s the Connect to PS4 feature and an extras section with access to a current games catalogue, PlayStation blog, PS4-related YouTube videos and competitions. In the middle you’ll find the socially-driven (and not yet live) What’s New section where you can tell users what you have been playing and watching. Additionally, there’s access to the Playstation Store, a place to view your profile, trophies, settings and a list of PSN friends. The two main features most likely to get any use is the ability to your phone or tablet as a second screen and make purchases when away from your console. Both will require the PS4 console to be on and it’s worth keeping in mind. When you launch the PlayStation Store it will actually boot you out of the app and into a web-based storefront. It’s a familiar-looking shopping environment where the drop down on the left lets you see all the content including PS4 games, movies, TV shows plus get details of deals, offers and upcoming releases. Once you’ve found what you are looking for simply make the purchase and it will start downloading to your console. Connecting to a PS4 requires an almost identical process to the one needed to set up a Remote Play with the PS Vita. You’ll need to go into the Settings on the PS4 console and find the 8-digit code to type into the PlayStation app and make the connection. Once the two are linked, key PSN information will be fed to the app. The smartphone or tablet running the app can now be used as a keyboard or a mouse to navigate through the interface. It’s a smoother experience typing with phone keyboard than on a controller but the touchscreen navigation is not brilliant. After seeing some potentially really interesting uses of Microsoft’s Xbox Smartglass companion app, it’s the second screen experience where we really expected to see more interesting uses of the PlayStation app. Disappointingly, there are currently no PS4 games available that support it. Second screen apps do exist, but the likes of EA, Activision and Ubisoft make their own companion apps for Battlefield 4, Call of Duty: Ghosts and Assassin’s Creed: Black Flag. Maybe PS4 exclusives will be made to add more exciting second screen functionality, but as it stands the feature is not any use at all. The PlayStation app is free so it’s worth trying it out, just don’t expect it to radically change the way you use the PS4. The standout feature by far is the ability to remotely buy items in the PlayStation Store, but unless you really need to remember what trophies you bagged playing Killzone Shadow Fall the night before, it’s a companion app you can currently live without. Next, read our piece on why PS4 Remote Play is Sony’s killer feature. The post PlayStation app appeared first on Trusted Reviews.